As cruise ships are not able to dock here you will be tendered ashore to downtown Kailua Village. At the pier you can catch a trolley to go around the town. It costs $1 per person. It is open air and you can make some wonderful photos. It will take you up to the shopping area (Target) and then all the way down to Magic Sands (beautiful white beach sand) and Kahaluu Bay for snorkeling. The drop off for is at the Outrigger hotel. Walk through the open air lobby and follow the walking path along the water. Beautiful grounds and views here. The Big Island of Hawaii is divided in half by three volcanoes, Hualalai, Mauna Kea, and Mauna Loa. To the east is the Hilo side which is the windward side of the island, and to the west is the Kona side which is the leeward side of the island. Kona is famous for sportfishing, snorkeling, sunsets and coffee. It means "leeward" in Hawaiian. The northern portion of the Kona side of the Big Island is also known as the Kohala district. The weather and ocean conditions can be vastly different on each side of the island depending on the time of year and the predominant trade winds. The Big Island is large and diverse, boasting 11 of the world's 13 climate zones. Because the mountains block the northeasterly trade winds, the Kona side of the island gets very little rain and enjoys more than 300 days of sunshine a year. Nestled at the bottom of the Hualalai Volcano, is the main western city of Kailua-Kona. In ancient times, this area was considered the premier place to live due to the excellent weather and good water. Many kings made their homes here. Later, missionaries built churches and residences turning the tiny fishing village into a small seaport. The main street, Ali'i Drive, runs along the oceanfront through the heart of the city from Kailua Pier to the Kuamo'o Battlefield. This charming town mixes numerous historical sites with modern tourist attractions. Restaurants, shops, and hotels abound. Sunsets viewed from the seawall are almost always spectacular. Kailua Village is easiest explored on foot. The rest of the island has Free Island-Wide Bus Service on all Scheduled Routes! 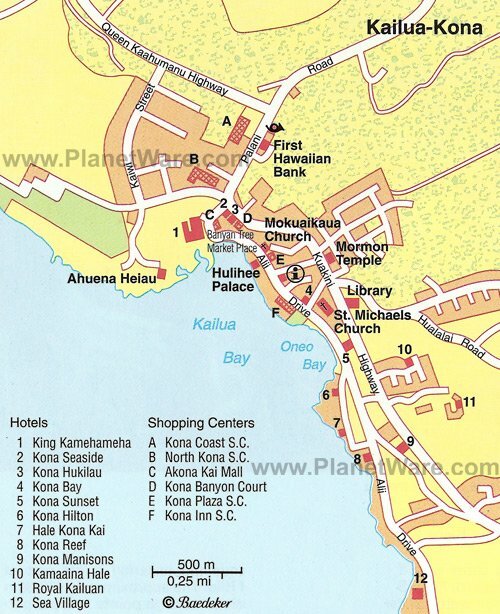 Car rental: There is an Enterprise in Kona, as well as the Thrifty and Dollar at the King Kam Hotel across the street from the tender pier. The Big island of Hawaii is diverse culturally and geographically making this a most interesting and educational place to visit. The world renowned erupting Kiluaea volcano and ancient petroglyphs dating back hundreds years. The Big Island is also home to best snorkeling and diving cove in the islands, Kealakekua Bay, and is the very spot where captain James Cook was murdered. Most people do not know: Mauna Kea Volcano, the tallest mountain in the world, measures 32,000 feet from its base to its summit at 13,796 feet above sea level. Shuttles for Hilo Hattie's (a famous Hawaiian clothing store) and Wal-Mart will pick you up at the pier. There is a farmer's market Wed-Sun, 7am to 4pm.